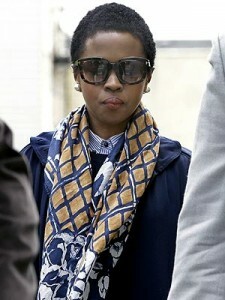 American singer-songwriter Lauryn Hill is to spend three months in prison for failing to pay around $1 million in taxes. The former Fugees singer and mother-of-six, is said to have plead guilty to three counts of failure to file tax returns for 2005, 2006 and 2007. It is thought that the singer earned an estimated $1.8 million during that time. Sentenced yesterday (May 6th), Hill will not only have to serve three months in prison, but must also pay a $60,000 (£39,000) fine. Once released, she will then have to spend a further three months in home confinement and under parole supervision for a year. The successful songstress, best known for her hits with The Fugees which include ‘Killing Me Softly with His Song’ and ‘Ready or Not’, took a step back from the music industry during the very years she was accused of dodging tax. Hill’s rejection of the limelight was a result of what she described as ‘a climate of hostility, false entitlement, manipulation, racial prejudice, sexism and ageism’ – Hill’s take on the modern music industry. Lauryn Hill will report to an unnamed prison, on the 8th of July. This entry was posted on Sunday, May 12th, 2013 at 4:04 pm	and is filed under Music News. You can follow any responses to this entry through the RSS 2.0 feed. Both comments and pings are currently closed.